Clean. Sleek. Stylish. These are all adjectives one could use to describe the latest addition to the Häfele America Co. functional hardware offerings: the Grass Vionaro drawer system. Adding the Grass Vionaro to Häfele’s already robust line of drawer options makes ideal sense. In a way, it’s slim, minimalist box and double-walled design is exactly the sort of thing customers have been clamoring for on account of its superior performance and clean, sleek look. Mounted on Grass Dynapro rack and pinion slides, the Grass Vionaro has a maximum load capacity of 88 lbs. Available dimensions cover all of today’s popular sizes including 15”, 18” and 21” depths for drawer boxes up to 48” wide. The Grass Vionaro can be had in 3 ½” inch or 7 ¼” heights, making it a great option for regular and deep-depth base cabinet drawers. Stocking finishes include Graphite and Silver Grey. 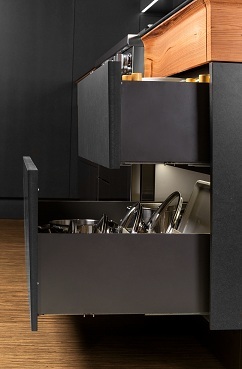 Taking function beyond the standard drawer box, the addition of aluminum fronts make the Grass Vionaro an excellent choice for internal pullouts too – whether it be to store fine china, kitchen appliances or even typical pantry staples.